The old £10 note will cease to be legal tender at the end of March 1 2018. From then on, notes must be swapped at the Bank of England. New polymer £10 notes already account for 55% of all those in circulation. LONDON — Britain’s old £10 note will cease to be legal tender from the beginning of March next year, the Bank of England said in a statement on Tuesday. The old note — which features famous evolutionary biologist Charles Darwin, and first came into circulation in 2000 — can no longer be used in shops or other financial transactions from the end of March 1 next year. After that, only the new polymer £10 will be legal for use. It was already known that the Bank of England planned to withdraw the Darwin £10 during the spring of 2018, but no formal date had been provided until now. The old note is being gradually withdrawn from circulation, and the new £10, which only entered circulation in September, already accounts for 55% of £10 notes currently in use. While Brits will no longer be able to spend the old note after March 1, it will still be possible to exchange the notes at the Bank of England by swapping them in person at the bank’s City of London headquarters. 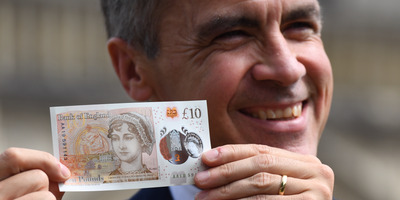 The new £10 is made from a high tech polymer and features an image of the famous author Jane Austen, alongside a quote from her most famous work, Pride and Prejudice. According to the bank, the new note is the most technologically advanced it has ever made, including a series of new features, both visible and invisible that make it much more difficult to counterfeit the notes, which are printed on an advanced polymer made by the firm CCL Secure.